Five Years ago on 06 August 2010 I wrote The Atomic Age Turns 65, on the 65th anniversary of the use of the atomic bomb that destroyed Hiroshima, Japan — the first atomic bomb of the first nuclear war. Now, five years later, the Atomic Age has reached its three score and ten, and we have another five years of historical perspective on what it means to live in the Atomic Age. In this previous post on the 65th anniversary of the Atomic Age I discussed the failure of philosophers to think clearly about nuclear weapons and nuclear war. This is no more glaring that the failure of politicians, or of any other class of society, except that it is less forgivable in philosophers, because philosophers should be more aware of political and ideological bias, and therefore better able to avoid it. 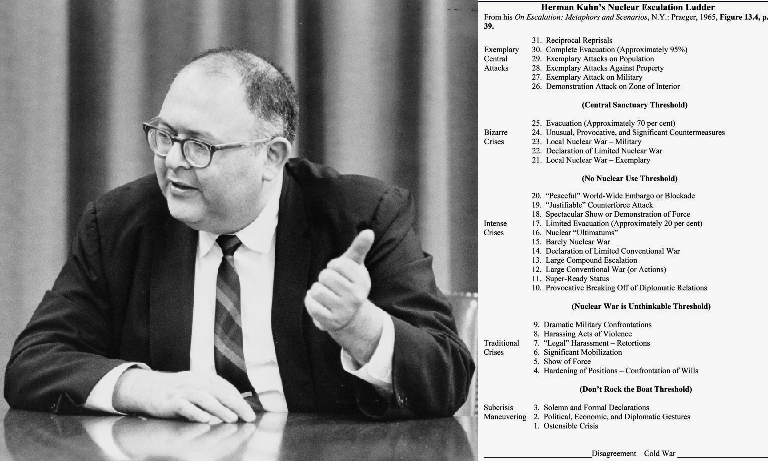 The few individuals who did think clearly about nuclear weapons and nuclear war — most notably Herman Kahn — were often demonized for “thinking the unthinkable.” How many years, how many decades, how many generations before we can think dispassionately about our ability to destroy ourselves? 07 October 1963 President Kennedy signs the Limited Nuclear Test Ban Treaty. White House, Treaty Room. Photograph by Robert Knudsen, White House, in the John F. Kennedy Presidential Library and Museum, Boston. While the atomic bombs that ended the Second World War did not trigger an age of atomic warfare (at least, not yet), it did trigger a period of the development of atomic weapons, and this led to a period of intensive atomic testing that continued until the pace of atomic testing was slowed somewhat by the Limited Nuclear Test Ban Treaty. The period of the most intensive testing of nuclear weapons corresponded with the period of the highest tensions of the Cold War. This suggests that the Cold War not only consisted of proxy wars in Third World nation-states, but also the proxy war of nuclear testing — nuclear warfare at one remove. The Comprehensive Nuclear-Test-Ban Treaty has not come into force officially, but most nation-states have chosen to abide by its provisions nevertheless. The only nuclear tests in recent years — in recent decades — have been those of India, Pakistan, and North Korea, all of which were undertaken in the face of significant international disapproval. The Cold War is over and nuclear weapons testing has slowed to a trickle. We are very slowly and gradually putting the nuclear age behind us. Once nuclear weapons were developed, it was often said that the nuclear genie could not be put back in the bottle. That is true, in so far as we have the knowledge and the technology of nuclear weapons. Moreover, each year this knowledge and technology is more widely distributed and more available. Now deliverable nuclear weapons are seventy years old; in another ten years, nuclear technology will be eighty years old, and not long after that nuclear weapons technology will “celebrate” a centennial. Assuming that human civilization remains intact, the knowledge and the technology will not only remain intact, but will be more widely available than ever. Nevertheless, we have reason to hope that we can exercise rational control over our nuclear weapon technology and avoid a second nuclear war. This hope is certainly not a certainty, but it is based on evidence, and there are historical parallels that could be adduced. If we had cultivated the ability to think clearly and dispassionately about nuclear weapons and nuclear warfare instead of heaping shame, scorn, and disapproval on those who did so — driving it underground into secret military and government think tanks — we would be capable of a more clear-headed assessment of where we are seventy years into the Atomic Age. Instead, we have the hopeful record of controlling this technology coupled with silence and discomfiture with plain speaking when it comes to this hopeful accomplishment — a mixed record, but at least a mixed record that is consistent with the continuing existence of our civilization. I expect this mixed record to continue, despite provocations. If we can prevent nuclear war for seventy years, we can continue to prevent it for another seventy years. If, despite the desire of many nation-states to possess nuclear weapons, non-proliferation efforts can make this possession expensive and difficult, we can continue to make proliferation expensive and difficult. More nation-states will join the “nuclear club,” but they will do so with untested arsenals, knowing that their conventional weaponry is probably more effective and does not involve pariah status in the international community. And we have to diffuse the tension the constant and continual low-level conventional fighting that is taking place around the world. This may sound like a less-than-ideal, less-than-optimal nuclear future, even a cynical future, but it is, again, a nuclear future consistent with the continued existence of civilization. And until we think our way through to clarity about nuclear weapons and nuclear warfare, this remains the closest to an ideal and optimal future that we can reasonably hope to have. Often when I write about emerging strategic trends I consider the long term future and make a particular effort to stress that little of the trend will be glimpsed in our lifetime, but at present I will consider the development of a strategic trend that is likely to be realized in the near- to mid-term future, i.e., a strategically significant technology that may develop into maturity or near-maturity within the lifetime of those now living. The technology is precision munitions and weaponry, and the strategic capability that mature precision weaponry will make possible is what I will call qualitative strikes. Before I come to qualitative strikes proper, I want to review the military and strategic context out of which the possibility of qualitative strikes has emerged. Soviet Yangel R-16 two stage ICBM in its silo. In the early stages of the Cold War when nuclear weapons were primarily ballistic missiles and ballistic missiles were the most accurate of nuclear delivery vehicles, the nightmare scenario (featured in many films of the era) was a NORAD alert that hundreds of thousands of Soviet Missiles were already launched and were on their way over the pole to targets in North America. The US would then have less than thirty minutes to decide whether or not to launch a massive retaliatory strike of its own, and it could not wait until the missiles actually landed and nuclear strikes were confirmed because that would be too late. This was the Atomic Age parallel to the First World War dilemma of putting troops on trains that could not be recalled because the scheduling of transportation was so precise. Once the missiles flew, there was no calling them back. If you launched, MAD was initiated, so you needed to be sure you were responding to the real thing. The essence of Cold War MAD doctrine was this massive nuclear exchange. Cold War targeting lists were almost indiscriminate in their presumption of mass annihilation; many major cities had a dozen or more warheads targeted for them, as though the intention were simply to “make the rubble jump,” as Churchill said of the Nazi bombardment of London. A massive nuclear exchange involved mutually assured destruction for the powers involved in the exchange, and since MAD was understood to be a guarantor of Cold War peace — since it would literally be madness to allow a massive nuclear exchange to take place — the very idea of either anti-ICBM “counter-force” targeting or of developing a “second strike” capability was interpreted as a hostile act of one power against the other. 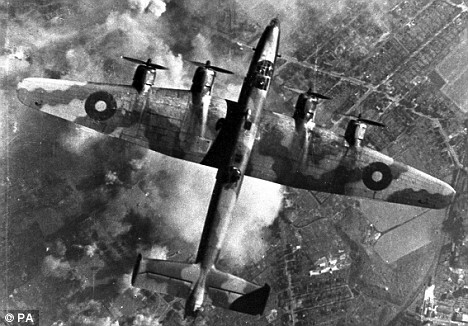 Strategic bombing during the Second World War demonstrated the possibility of leveling cities; nuclear strategy was simply an extension of this. We think of the end of these developments in nuclear warfighting strategy as a consequence of the collapse of the Soviet Union and the end of the Cold War, but this phase of nuclear strategy would be ended anyway, regardless of the fate of the Cold War. If the Soviet Union were still in existence today, we would no longer be talking about MAD — or, if we were, it would only be because traditionalists were clinging to a doctrine that no longer had strategic relevance. While many nation-states have land-based ICBMs, these weapons systems are already relics. They belong to a age of indiscriminate and massive attacks that emerged from the strategic bombing of the Second World War. If the bombers of the Second World War had had the capability to execute precision strikes, they would have done so. But this technology was not yet available. As the next best strategy, the only possible strategy, “area bombing” for the purpose of “de-housing” enemy populations became the norm. Once planners, strategists, air crews, and populations became inured to the routine of leveling entire cities, the atomic bomb was simply a cheaper, quicker, more efficient way to do the same thing. General Curtis LeMay of the Strategic Air Command. The only subtlety at the stage of nuclear strategy brought to maturity during the Cold War — if it could even be called a subtlety — was whether any nuclear capacity would remain on either side to deliver a second strike after the initial massive exchange (a “second strike” capability). Cold War strike capacity did not lie exclusively in ICBMs. In addition to ICBMs, there was the Strategic Air Command (SAC) under Curtis LeMay, who learned his trade during the Second World War. While LeMay was perhaps the most renown American advocate of strategic air power, it was Arthur “Bomber” Harris of the RAF who presided over the strategic bombing of Germany, with the mantra that, “The bomber will always get through.” Again, the Second World War was the template for what followed. Air Marshal Arthur (Bomber) Harris. The ultimate guarantor of second strike capability was the ballistic missile submarine. With dozens of submarines submerged deep in the world’s oceans, each submarine with a dozen missiles or more, and each missile with a MIRV with a dozen or so warheads, a single surviving submarine had the capacity to deliver a devastating second strike. Moreover, a submarine could sneak up close to the coast of an enemy’s territory and let loose its ballistic missiles from short range, leaving the enemy with only minutes to respond — and no real assets that could respond to a strike less than 15 minutes away. The traditional “triad” of Cold War deterrence consisted of land-based ICBMs, strategic bombers, and missile boats, but all of this took time to develop; it was not until the early 1960s that both the US and the USSR had a fleet of operational missile boats. When both sides in the Cold War possessed the nuclear triad, and therefore a second strike capability, the MAD equation continued to hold good. In the strategic context of MAD, nuclear strikes were quantitative strikes, and each side in the Cold War was motivated by the competition to assemble the quantitatively largest arsenal in order to deter the other side. The Cold War was a numbers game — cf. Kennedy’s “Missile Gap” — and this numbers game escalated with predictable results: tens of thousands of nuclear warheads perpetually maintained in readiness. The agreements to limit nuclear weapons only institutionalized the overkill of MAD doctrines. From this point, it would have been difficult to escalate any further, except for technologies that were viewed as inherently destabilizing because they might shift the balance and make one side or the other believe that they were no longer subject to the MAD calculation. It is of the essence to understand that global Cold War stability depended centrally on the inescapability of MAD. The Reagan-era “Star Wars” missile defense initiative was just such a destabilizing factor, but by this time the Soviet Union was already in terminal decline. Anti-missile defense systems had been designed and built prior to this, but clearly the initiative still law with the offense; the technology simply did not yet exist to bring down an ICBM. Soviet decline coupled with the emergence of technologies that would make missile defense a viable possibility led to the end of the Soviet Union and MAD and the Cold War. Not only are these Cold War ideas dated by subsequent political developments, they are also dated by subsequent technological developments. Even if the Soviet Union had survived intact to the present day, the nightmare MAD scenario of Cold War planners would no longer be relevant because weapons systems have moved on. One of the greatest of the revolutions in military affairs (RMA) has been the introduction of precision-guided munitions, and the eventual issue of converting to a “smart” arsenal means a transition from quantitative strikes to qualitative strikes. The shift in emphasis from nuclear to conventional armaments with the end of the Cold War facilitated the speed of this transition. Nuclear strategy suddenly went from being a top priority to barely making the list of priorities, and defense dollars began to flow into conventional weapons, and here there were opportunities for improvement that were not understood to be politically destabilizing. The idea of qualitative strikes is not at all new. One could say that qualitative strikes have always been the telos of military operations. The air forces of the Second World War aspired to precision bombing, but this was not yet possible. During the Cold War, some missiles were targeted according to a “counter-force” strategy, i.e., they were targeted at enemy ballistic missile silos, but this only played into the MAD calculation, because it meant that to wait meant to lose one’s primary strike capability. If you could completely wipe out your enemy’s ballistic missile silos in a age when ICBMs were the primary nuclear deterrent, you would leave your enemy with the uncomfortable choice of retaliating massively on civilian population centers or accepting defeat. A successful counter-force attack would constitute a qualitative strike, and qualitative strikes pose political dilemmas such as that outlined. This is why such ideas were considered inherently destabilizing. 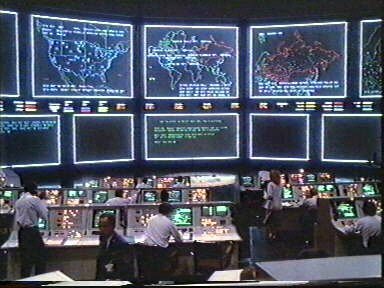 But this level of technology was not practicable during the time when ICBMs were the primary nuclear deterrent. Although the press today reports civilian casualties as if they were disproportionately high, in historic terms both civilian and military casualties are at the lowest levels ever. With the industrialization of war the technologies of warfighting experience an initial exponential growth in lethality, but as precision begins to outpace sheer quantitative destructive power, the warfare of industrial-technological civilization passes The Lethality Peak and casualties fall as strikes converge upon qualitative precision. In other words, the rapid emergence of precision guided munitions in the battlespace has been effective. They work. And they’re getting better all the time. The efficacy of precision guided munitions suggests the possibility of a complete shift away from quantitative destruction to qualitative strikes, i.e., strikes that selectively pick out a certain kind of target, or a certain class of targets. This is already a reality to a limited extent, but it will take time before it is fully translated into policy and doctrine. In A Glimpse at the Near Future of Combat I mentioned a Norwegian satellite that will track all ships (over 300 gross tons) in Norwegian coastal waters. Most ships have transponders, indicating basic identification information for the vessel. In the near future of autonomous vehicles, it is likely that most vehicles will have transponders on them. Most individuals carry cell phones, which are essentially transponders, and we know the the Snowden leaks about the NSA surveillance program how thoroughly “big data” applications can track the world’s cellular phone calls. Fixed assets like cities and industrial facilities are even easier to map and track than mobile assets like ships, planes, vehicles, and people. What we are looking at here is the possibility of computer systems sufficiently sophisticated that almost everything on the surface of the earth can the identified and tracked. To have a total system of identification and tracking is to have a targeting computer. Couple a targeting computer with precision guided munitions that can pick out small targets in a crowd and be assured of destroying these targets with a near-total absence of collateral damage, and you have the possibility of a military strike that does not depend in the least upon quantitative destruction, but rather upon picking out just the right selection of targets to have just the right effect (political or military, keeping in mind Clausewitz’s dictum that war is the pursuit of politics by other means). This is a qualitative strike. None of these developments will go unchallenged. The dependency of qualitative warfare upon computer systems points to the centrality of cyberwarfare in the integrated battlespace. If you can confuse the targeting computer of the weapons’ guidance systems, you can defeat the system, but systems can in turn be hardened and made redundant. Other measures and counter-measures will be developed, and escalation will be an escalation in precision and the possibility of qualitative warfare (since those who attack precision warfighting infrastructure will need to be equally precision in their attempt to defeat a precision weapons system) in contradistinction to the escalation of quantitative warfare that defined the twentieth century. Yesterday the US dismantled the last B53 nuclear bomb, which was the largest yield nuclear weapon in the US nuclear arsenal, with a yield of about 9 megatons. This was not the highest yield US nuclear weapon ever fielded. This distinction belonged to the B41, with a yield of about 25 megatons. The last B41 was dismantled in July 1976. While the B41 was a very high yield bomb by any measure, it was not the highest yield nuclear device ever built. This distinction belonged to the Soviet-made AN602, commonly known as the Tsar Bomba. The highest yield US bomb ever exploded was the Castle Bravo test, which surprised its builders by an explosion of about 15 megatons, three times the expected yield of 4-6 megatons. The Tsar Bomba was a relatively “clean” bomb, while the B41 was the most efficient production-line nuclear bomb in terms of yield to weight ratio. The B53 had a very long service life — nearly fifty years. With the end of the B53 we see the symbolic end of an era in strategic nuclear weapons. A bomb like the B53 or the B41 (or the Soviet RDS-9) could have, with a single blast, annihilated a contemporary megalopolis. It is interesting to note that the vastly expanded cities of today began to emerge at about the same time as nuclear weapons were invented, so that in this admittedly bizarre sense, the means of civilization to destroy itself perfectly kept pace with the scope and extent of the expanding urbanization of civilization. Of course, a contemporary megalopolis could be destroyed by multiple warheads, and most missiles and many other delivery systems are MIRVed and therefore have many warheads at their disposal, there is a certain elegance to the strategic calculus of one bomb, one city — this the ethos of the sniper — one shot, one kill — put into practice on a macroscopic scale. It should be obvious that, had the US and the Soviet Union chosen to continue to design and build bigger nuclear weapons, that this capacity was technically within their grasp. Perhaps it would be possible to build a bomb with a yield of 500 megatons, or perhaps even a gigaton bomb. But there was nothing large enough to destroy to make it worth the while to attempt to build such devices. And then the paradigm or war began to shift. Ultimately, even nuclear weapons design began to incorporate features of precisification. 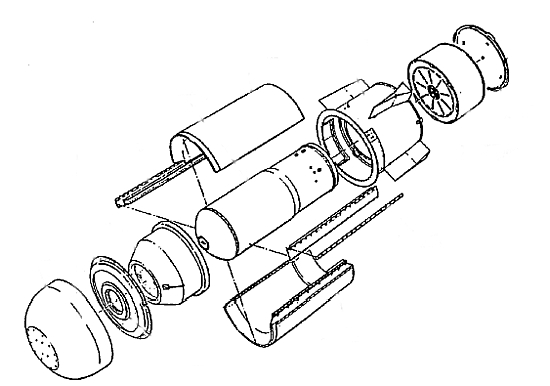 Mature experimentation with nuclear weapons design included innovative shaped charges and miniaturization. The age of the nuclear weapon as a purely strategic device is passing. Technologies of precisification and miniaturization are useful; you can do something with a precise or miniaturized nuclear device. It may sound odd to remark that a weapon is useful, but we must remember that throughout the Cold War nuclear weapons were strictly useless, present only to guarantee mutually assured destruction. Perhaps it would be more accurate to say that nuclear weapons had only a strategic use. If the nuclear powers chose not to build bigger bombs, and eventually chose to decommission and dismantle their largest warheads, this tells us that the strategic situation has changed, and that the strategic calculation has changed with the strategic situation. The limitation of the size of nuclear weapons and the decommissioning of larger weapons did not come about as a result of political pressure. While the B53 was old, there was no political pressure to eliminate it from the arsenal. The same cannot be said, for example, of the neutron bomb, which was not built for political reasons, or the Swedish nuclear weapons program, which was ended for economic reasons. These strategic decisions were strictly voluntary on the part of strategic planners, and as such they represent the purest expression of strategic thought. More than a year ago in The Atomic Age Turns 65 I wrote about the 65th anniversary of the Hiroshima nuclear blast. There I observed that, “What we now usually call the Second World War was also the First Nuclear War.” I also noted that there has been no Second Nuclear War. In the same spirit of unfamiliar periodization, we could call this period of time from the first use of nuclear weapons to the dismantling of the largest bomb the First Nuclear Age, which lasted less than seventy years. During the First Nuclear Age, bigger was better. Now bigger is no longer better, and we have entered the brave new world of the Second Nuclear Age, in which the proliferation of nuclear weapons seems likely and the concern of nuclear terrorism is a much greater danger than a massive decapitation strike in the form of ICBMs, bombers, and SLBMs. As the strategic logic of the Second Nuclear Age continues to unfold, nuclear doctrine will continue to change and adapt itself to changed circumstances. In the long term, these changes will eventually be concretely manifested in the nuclear arsenal. Given the slow pace of transition from doctrinal development to weapons production, the fact that world nuclear arsenals are already changing points to the reality of strategic change and confirms the End of a Nuclear Era.